As a result of the June 2018 election for chapter leaders on the Administrative Council, the following shows our new Admin Council for 2018-2019. The Chapter Officers page has live links to their chapter contact address and to their biographies. 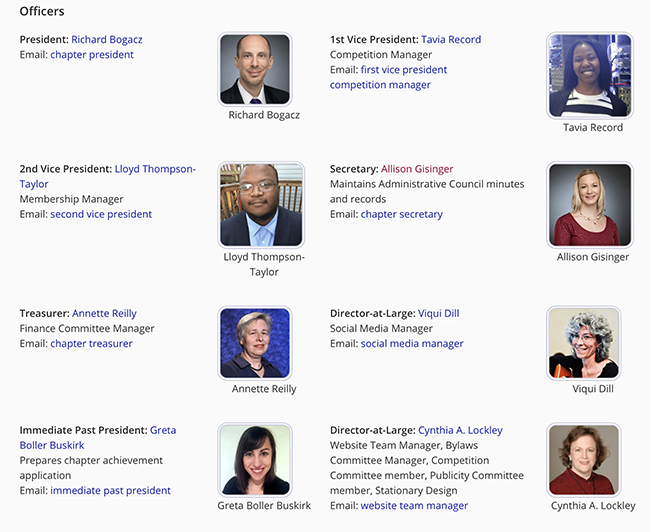 Check it out and get to know your admin council. Some of the new officers have taken on managing a chapter committee. We have many openings for serving on the chapter committees and opportunities to become part of the chapter leadership, learn new skills, share your expertise, show your stuff, learn more about STC and how the chapter operates. Bring us your ideas. See the Chapter Committees page. Please review the committee openings. An important role we are looking to fill is the Events Manager. Click on the position title to find out what is involved for helping with that role. Some are small tasks and may be only be a one-time effort—you may want to volunteer for more than one. That’s great. The more roles we can get filled, the smoother the chapter will operate. We like volunteers. We reward you for your efforts in various ways (such as a certificate of appreciation, a free attendance for working an event, a gift, flowers, we’ll think of something). We’ll let your boss know about you. Review the list of Current chapter volunteer openings and read the job descriptions. To sign up as a volunteer, fill out the Volunteer form.